As we approach spring and summer wedding season, this is the perfect time to start creating engagement rings and wedding bands. I LOVE making rings, especially ones that honor the love shared between two people, and I would be honored to work with you! Some people have a clear design in mind; others have an idea but don’t know how that translates into a design. Some people have existing jewelry they want to use to make a “new” heirloom. Whatever the approach, I would be delighted to help. You’ll see below some of my recent designs. I love the way they turned out, and I hope you do too. 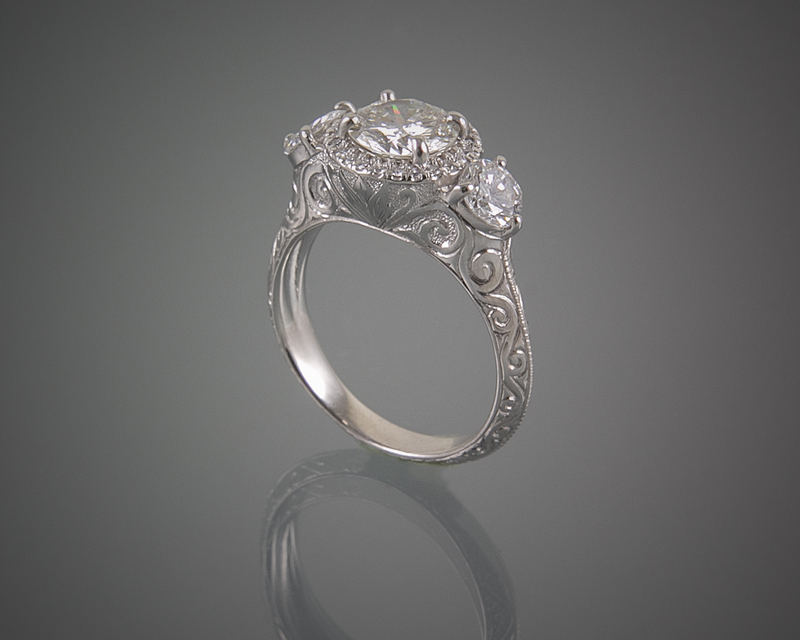 This is a 14K white gold engagement ring using a design from my Leaf collection. 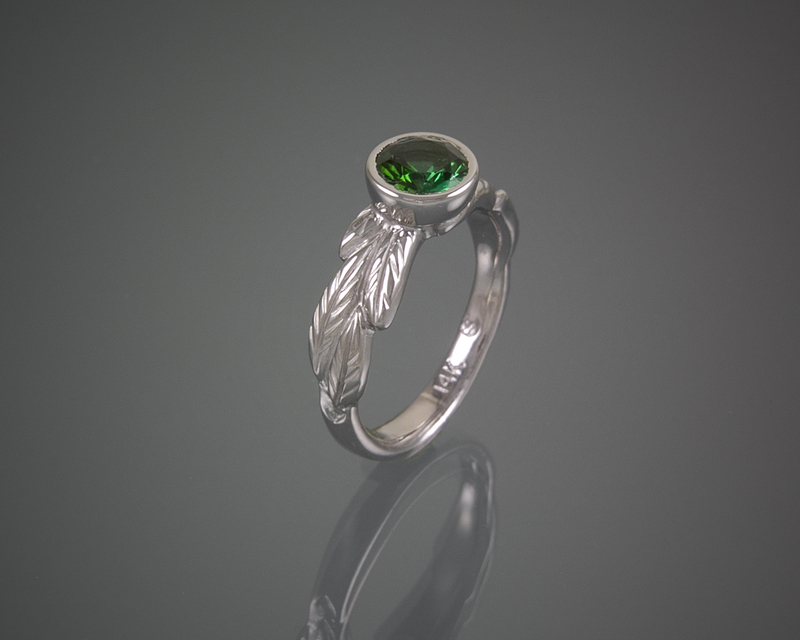 Instead of a diamond, the client wanted to use a green gemstone to represent the evergreen trees of Maine. 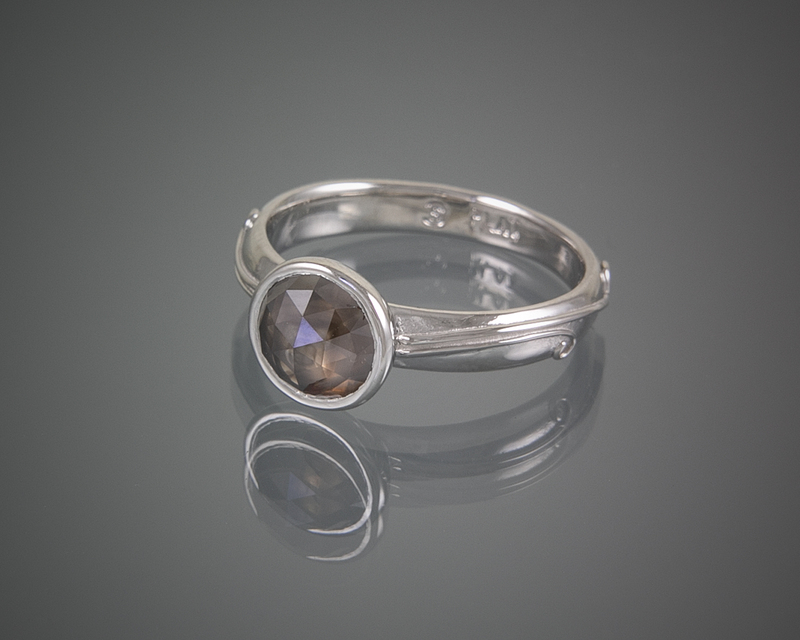 The contrast of the beautiful Maine Tourmaline and the white gold are stunning, don’t you think? Do you prefer something unique yet simple? 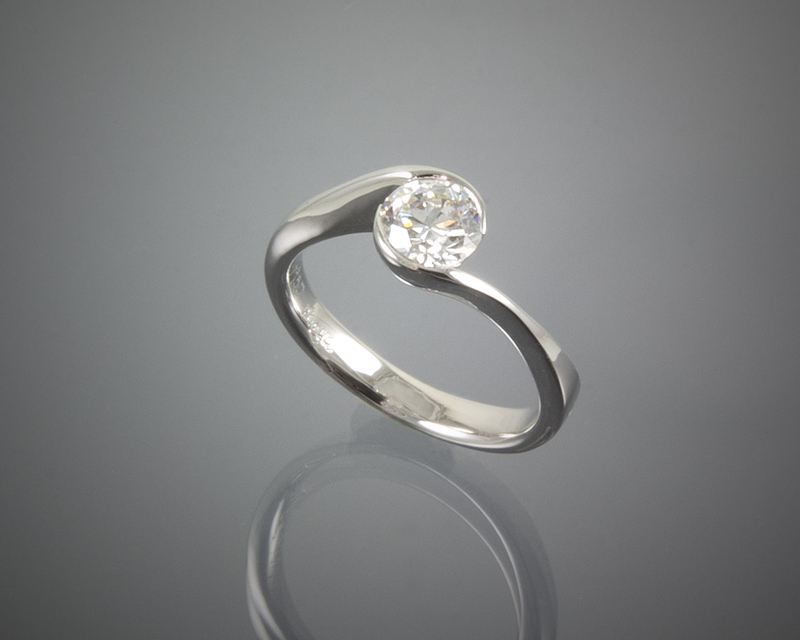 The client’s diamond looks beautiful in this platinum Wave Ring setting. It is one of my classic designs and can be crafted in any metal. Perhaps an ornate ring is your aesthetic? Below are two detailed designs. 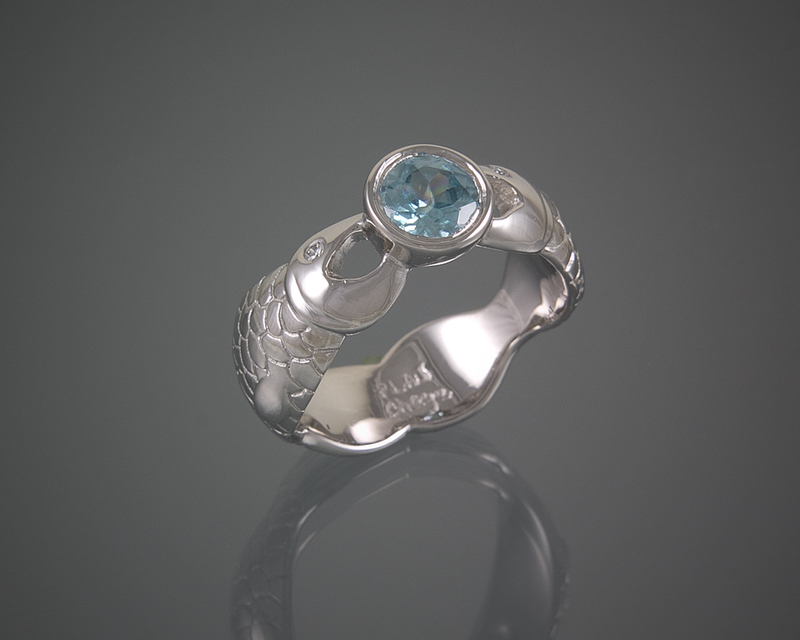 This ring, made for clients in Alaska, was inspired by the couple’s love of fishing. Hand carved from wax, I made it with platinum, a blue zircon center stone and diamonds for the eyes. This engagement ring is vintage inspired with a beautiful halo around the center diamond and intricate hand engraving on the band. 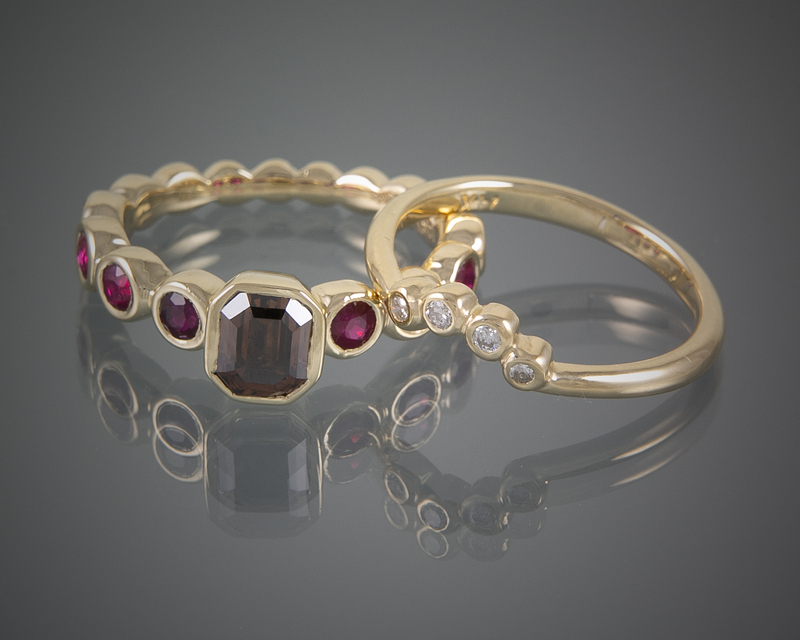 Finally, this yellow gold ring with a chocolate diamond, rubies and white diamonds is a fantastic example of how I can use existing jewelry to create a new design. I hand carved the designs from wax and cast them in gold. 100% of the materials were provided by the client. If an engagement or wedding is on your mind, book an appointment with me before you head to a jewelry store. I can show you more of my designs, and we can talk through your thoughts and ideas. I’ll also explain the process and outline the fees, so you can make an educated decision about the ring of your dreams!